B is now A, and B is for Average. What’s happened to the grading system? And where are the F’s? I must be living in Lake Wobegon, that mythical Minnesota town that my fellow Anokaian Garrison Keillor created where all the children are above average. The demise of the D and F grade came rather suddenly. It was the outgrowth of a society empowered by government legislation that no child is going to be left behind and the general hush of educators who know darn well that they better go along or suffer the wrath of sanctions. Contributing were non-performing students, advocates for the importance of self-esteem, and parents who wanted to tell others that their child was on the honor roll. After this quixotic change, the A became a grade for those students achieving above the accepted standards at a school regardless of the state standardized test scores. A B mark was the grade provided for those students who did the work and the C was a gentleman’s way of saying your work was done, but poorly. That was it. D and F grades were reserved for those students who simply did not do any work and for those whose parents would not object. These low grades were also avoided at schools where principals believed that if a student received a failing grade, the teacher wasn’t doing his or her job. Yep, it was the teacher’s fault, not the responsibility of students or parents. The F grade also meant that the principal would have to justify that grade to his/her superiors, which was never good unless he had coached with the superintendent. Some principals, helpless to change grades ethically, began a silent campaign to force teachers into not giving low grades. That would mean pressure for them to provide remediation for students who failed regardless of that fact that in all probability the pupil had many years of remediation. The F grade also meant the student might have to repeat a grade or worse: the student would stay at that school another year. To the rescue came social promotion, which meant that maybe the child wasn’t ready to learn or, perhaps, didn’t buy into the threat of being left behind. After all, the government had mandated that they couldn’t be left behind, so why really try. Besides, watching their friends being promoted might hurt their self-esteem. Some teachers soon realized that the only thing that really mattered were happy parents and smiling administrators and many started shelling out A, B, C grades, eager to pass their charges onto the next teacher. If that teacher were a holdout for the D and F grades, he or she would get messages from parents indicating that they were the only teacher with whom the child was having a problem. A check of the record would confirm this and only the brave and tenured stood firm waiting for the mandated standardized test to confirm their assessment. Unfortunately, the results came out during the summer. I remember talking to my mechanic whose daughter went to a private school and had about a 4.3 grade point average. Don’t ask me how that happened, but apparently in schools across the land an A is no longer the highest grade you can get. A new higher mark has been installed, further cementing the death of the A, B, and C grading system. It is given to those students who take “more advanced” classes. Don’t even try to figure this out, but apparently there were so many straight A students that there had to be a new method used to increase the 4.0 so that colleges could see that these students were way about average. Of course, average was no longer a C, it had become a B. So my mechanic was dismayed that his daughter’s private school had provided an excellent education, but her SAT scores were under 1000. He complained to me about the unfairness of the tests and about the Democratic legislature that had mandated them. Honest. Never a mention of the daughter’s preparation. The good news is that she was accepted at a church-based university, so I felt safe to take my car there afterwards - making sure no one had placed an Obama sticker on it before I went. 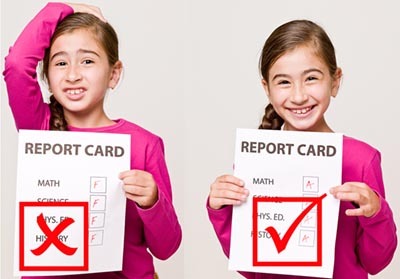 The problem is that grade inflation produces students with high expectations and this hope is shattered when they meet with the realities of standardized testing. But hey, that’s someone else’s problem. In fact, with the declining validity of the grades, the SAT has become a more valuable tool for predicting academic success in college. Of course, the end of D and F grades is not without its rationale. Good grades enable schools to tout their honor rolls and for some private schools, to retain their students. Why would anyone send a child to a school and pay extra to have them receive failing marks? There are also teachers who feel that certain children may benefit from a higher grade as it could make the student feel better and, perhaps, get them to understand they can be successful. Other reasons including getting more positive parent comments. The emphasis is not on learning at some schools, but the grades. When the grades are checked by administration it also looks good to them to see high class averages by teachers. I have seen some of the best teachers called into a principal’s office for a meeting about low grades and I have known administrators to put pressure on teachers to change grades. Of course, over my years of teaching in Canada and the United States I have had over 15 different principals and the quality is extremely uneven. Next is the fact that teachers can face an exodus of students as parents search to make their children happy and face a less stressful class. Teachers not wanting to risk the wrath of their fellow educator who get these transfers may decide to loosen up their standards. Finally, teachers are perhaps practicing something they learned in university. Nearly half of all grades at such universities such as Duke, Harvard, and Columbia are in the A range, and the University of Illinois reports that A grades constitute more than 40 percent of all grades and outnumber C's by almost three to one. So rest in peace, D and F grades. There just isn’t the need with so many superior students. And not just in Lake Woebegon. Student perceptions of grading practices: Does average class performance equal a C grade?